The high-performance SSW900 soft starter provides gentle starting and stopping of three-phase induction motors along with comprehensive motor protection. The soft starters by WEG provide gentle starting and stopping of three-phase induction motors along with comprehensive motor protection. They provide algorithms for regulating induction motors as well as torque control. The series covers output currents from 10 A to 412 A in the wide voltage range of 220 to 575 V AC (three-phase) with four case sizes. 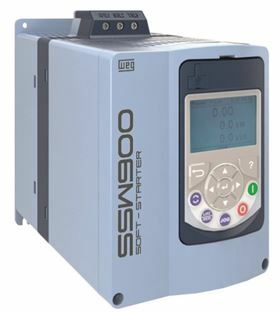 The SSW900 is suitable for a range of applications, including blowers and ventilation fans, axial, radial and centrifugal pumps, metering pumps, stirrers and mixers, conveyor belts, extruders, dryers and industrial ovens, turntables, and ball or hammer mills. The LCD display and a new user interface aim to simplify operation and make programming changes quick and easy for users. Commissioning and programming are assisted by wizard functions. USB functionality integrated in the user interface enables configuration of the soft start parameters using the free Windows-based WPS software, as well as programming of the internal SoftPLC using the free WLP software. The user interface language options include English, German, Portuguese and Spanish. Users can choose from Modbus RTU, Profibus DP, DeviceNet, Ethernet/IP, Modbus TCP and Profinet I/O industrial communication protocols for device connectivity. WEG has extended its W60 motor series, which now covers a power range of 500-16,000 kW at frequencies of 50 or 60 Hz.